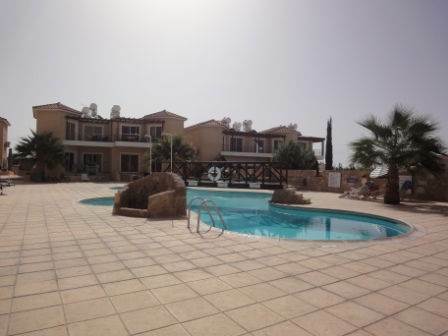 Cyprus Property Blog by Cleo : Spacious Kato Paphos Apartment with Title Deeds - NOW SOLD! • 55 sq. m., 1 bath, 1 bdrm apartment "Top Floor" - €79,000 EUR - Title Deeds - NOW SOLD! Kato Paphos, Paphos - This beautifully presented apartment is located in the sought after area of Kato Paphos, a short driving distance from the many shops, restaurants and harbour. Being a project of two storey blocks, the apartment is on the first and top floor. The property features a light and airy open plan lounge, dining area and kitchen. The kitchen is well equipped with built-in oven and electric hob/extractor, fridge freezer, washing machine and microwave. An attractive archway leads to a large double size bedroom with fitted wardrobes and dressing table, and a good size family bathroom. Patio doors from the lounge and bedroom open onto a large pergola covered balcony, a perfect place for outdoor dining. The swimming pool area has a huge terrace, with plenty of space for relaxing, and the pool with roman steps has an attractive wooden bridge, and showers to the side. This property is in excellent condition with good quality finishes. It has full title deeds and is being sold fully furnished.